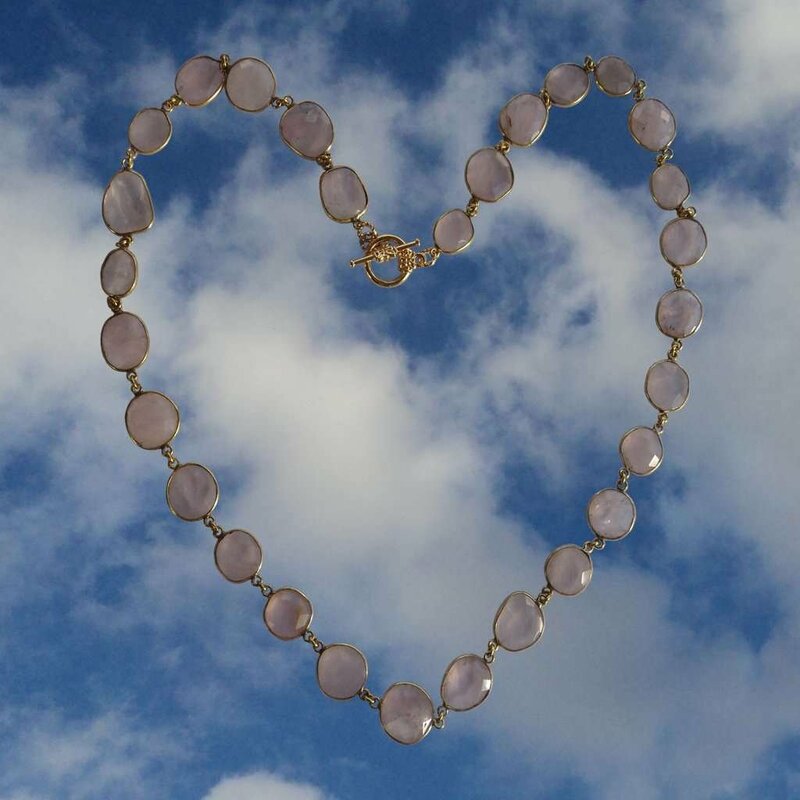 This necklace has 27 Rose Quartz Crystals of different shapes and sizes approximately 16mm x 11mm in size (mix bigger or smaller ) framed in Gold Plated Brass. Necklace is approximately 24-25 inches with gold plated toggle clasps. Comes in a beautiful gift box. Necklace has 27 gemstones of different shapes and sizes approximately 16mm x 11mm in size ( mix bigger or smaller ). The number of gemstones in each necklace is 27 that is VERY significant as each number carries specific energies behind it. Number 27 carries the qualities and vibrations of the number 2 and number 7. Number 2 resonates with the attributes of intuition, duality and finding balance, mediation and co-operation, sensitivity and selflessness, serving others and your Divine life purpose and soul mission. Number 7 relates to mysticism, spiritual awareness, persistence of purpose, understanding and introspection, spiritual enlightenment, empathic and psychic abilities. These energies combine to make 27 the number of the humanitarian, of harmony, spiritual insights and unconditional love. 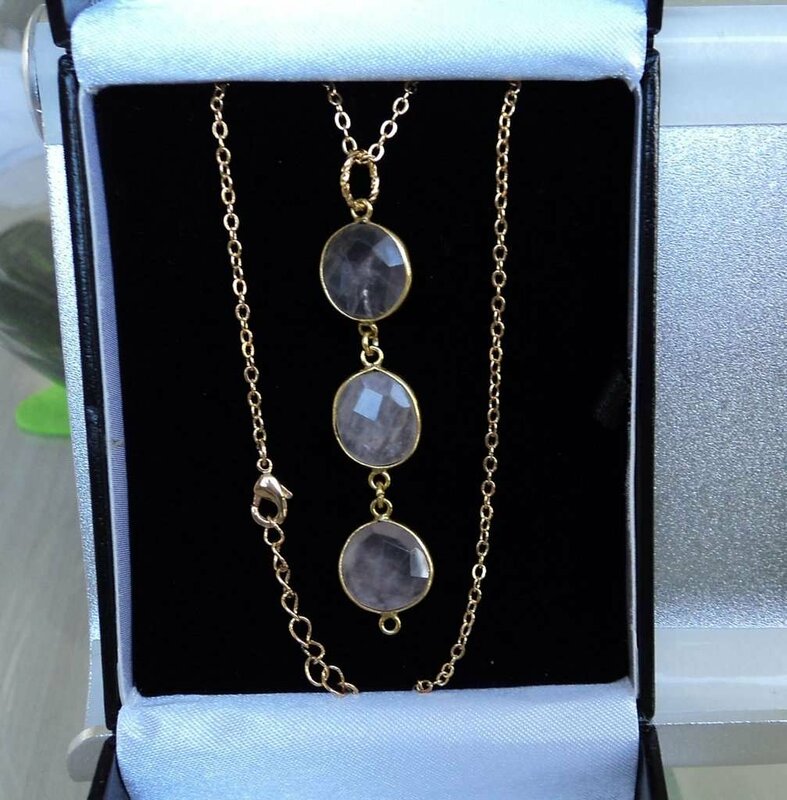 For a limited time only when your order total reaches $300.00 or more you will receive a FREE GIFT - a beautiful genuine either Rose Quartz or Labradorite Brass & Gold Plated Pendant on a Gold Plated Chain valued at $74.99. Simply state which pendant you would like to receive at checkout in the notes box, or send us an e-mail announcing your choice. If you don't let us know which one you prefer to receive we will automatically send you a Rose Quartz pendant. This offer is not eligible on previous purchases. This offer is valid while supplies last. Cannot be exchanged for cash value.